View of Fisherman's Cove and Marina circa 1940. View of Fisherman's Cove circa 1940. 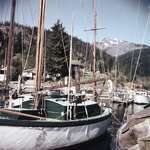 A view of the docks and boats in Fisherman's Cove. The surrounding mountains and islands can also be seen in the background. View of parking lot at Fishermans Cove Marina, 5908 Marine Drive. 75th Anniversary banners can be seen on lightposts. View of dry docked sailing boat with stairs and platform to access boat deck. Sign on platform reads Harbour Yacht Sales Ltd. Photo taken at Fishermans Cove Marina, 5908 Marine Drive. View of Fisherman's Cove marina. View from Fisherman's Cove marina. 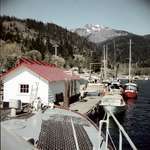 View of Fisherman's Cove in Eagle Harbour. View of sign for Fishermans Cove Marina, 5908 Marine Drive. Businesses listed: Harbour Yacht Sales Ltd., Race Rock Yacht Services Ltd., and Fraser`s Marine Service.